One of many buildings where magic happens. In 1816, while observing objects using two mirrors, Scottish scientist David Brewster noticed patterns and colors being recreated and reformed into beautiful new arrangements. He named his invention using the following Greek words: kalos meaning beautiful, eodos meaning shape, and scopeo meaning to look at. He realized that each part of his invention had to work together in order to produce something beautiful to the eye. The Kaleidoscope was born. And how many of us didn’t want to take one apart and see the inside when we were little? Well, I have been lucky enough to take one apart, see how it works, and find awe in the beauty it produces. Where did I find my Kaleidoscope? At Manns Restoration in Festus, MO. This business built by Michael Mann, has a great reputation for taking a vehicle and breathing into it new life. 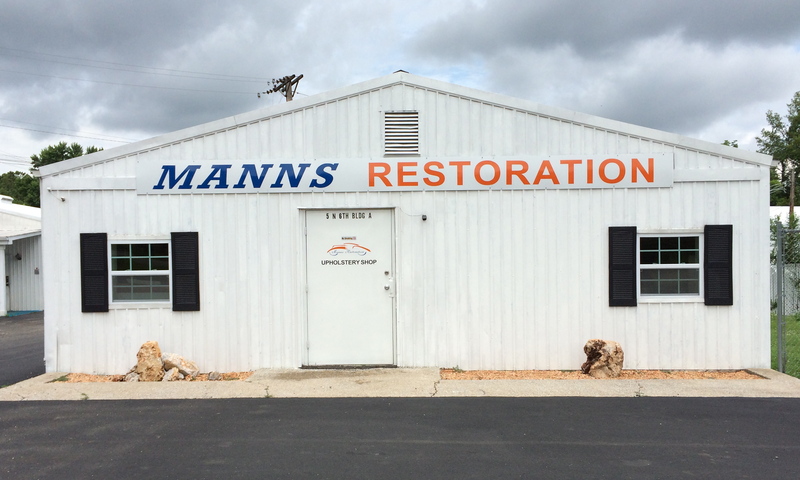 Manns Restoration is not a small town operation. It is as big and multifaceted as they come. While serving the needs of the local community, it also boasts both national and international acclaim. It goes without saying that my visit left me amazed and in awe of the talented work that goes on at 5 North 6th Street. Click here for the history of the business. What might you expect if you needed work done to your car, boat, or motorcycle? The process for each new client is unique, yet the same. An inventory is taken via questions regarding budget, ultimate usage of the vehicle, time frame restrictions, and level of perfection. For example will the vehicle be used for everyday driving or for show? Is there a wedding date? During its stay all details of work are documented in an individual binder and the client is kept apprised of progress throughout. Yes, that’s Mike with Jay Leno in the picture! Jobs of all sizes are considered-whether it’s a 2013 Grand Am fender bender or a complete recreation of a 1931 Studebaker. The entire team keeps up with the demanding challenges of the automotive world. 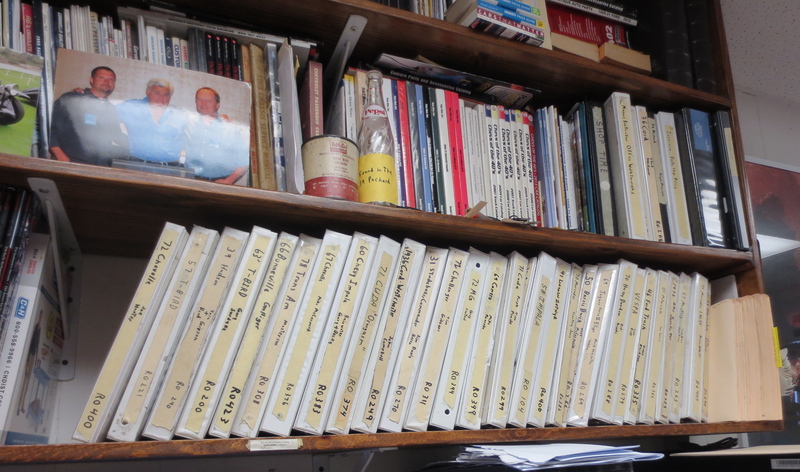 And if they don’t have the answer on site (I’ve never seen so many manuals), you can be sure they will find it. Mike says the internet has a purpose, but it is better to get knowledge directly from a person perfected in a particular car. Long gone are the days of visiting the local library. As I walked through the buildings of Manns Restoration, listening to Mike give a bit of history on each of the cars, I realized that this business is much like a kaleidoscope. The Kalos, or beauty, is Mike’s word and character. He believes that anything is possible and that doubt will kill you quicker than failure. His grandfather taught him to give his word and stand by it, eye-to-eye, handshake-to-handshake. Every customer and every car has meaning to Mike, and he knows that the end result is very important. I’m pretty sure this goes with that! The Eodos, or shaping, is created by each of the amazing team members I met. Precision in the paint, artistry in the upholstery, skill in the sanding- these are just a few of the bits and pieces that turn out a product that is certainly beautiful to look at. Each building that I walked through was consistent with its proud display of the American flag, and unique in the job that it held. Though separated by walls and parking lot, each building…each artisan was connected to all of the others. The work is in the details. Click here to see outstanding pictures from their website detailing the different aspects of the creativity and hard work. And the Scopeo, the observation piece, is the customer’s satisfaction and joy for a job well done. As stated on their website, Manns insures that each car leaves being ‘best in show’. 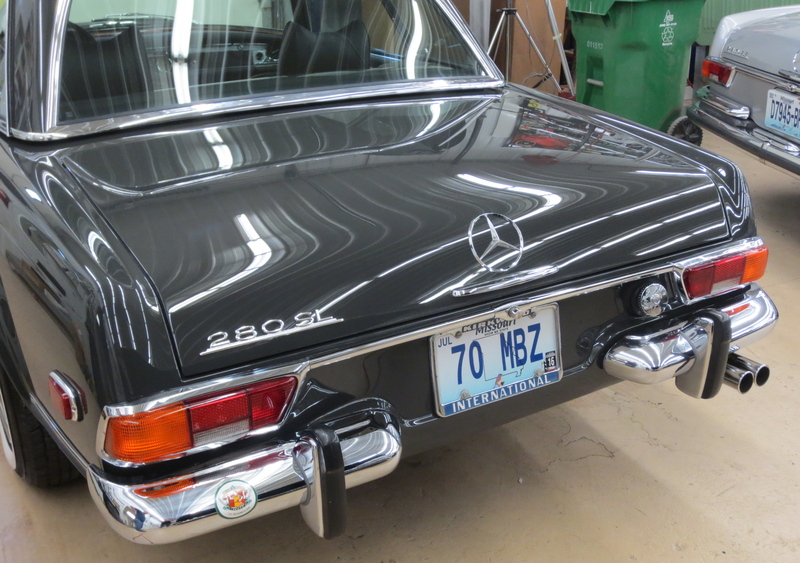 The car and oftentimes its history are restored. All the parts of the Kaleidoscope have come together. A business built on character and handshakes, automotive artisans like no other, and a ride restored …just like the images of a kaleidescope…beautiful. I’ve taken many drives down 61/67 in my beloved ’03 Mustang, driving right past 6th Street. Who knows, if I had known about Manns Restoration a bit sooner, Mike and his crew could have made new my ‘03. Click here for their complete website. A few final thoughts: 1. A huge thank you to Manns Restoration for the amazing tour of their site, and my apolozies for any inaccuracies in the article. 2. I would certainly have taken my 2003 Gt to them and left it in their care. This is big for me! Meaning-this is a must-have, go-to-place for all my automotive friends. 3. Mustang Maniac is this a bit what you’re all about across the pond? This entry was posted in Journal, Time Trials and tagged 03 Mustang, 1960 Impala, 1967 Chevelle, 1971 Challenger, 1971 Mustang, Kaleidoscope, Manns Restoration, Studebaker. Bookmark the permalink. Love this post, love the kaleidoscope analogy, and love the obvious appreciation you have for “the magic” that happens at Manns Restoration. Living in the same small town as Manns, I have always been impressed with how humble their business has remained over the years. As your post points out, Manns is not only national but also international. Even with all of that, they always welcome local business and treat everyone with the same respect. What a wonderful comment! The post doesn’t tell the whole story. But spot on about the magic. Mike said going to work was more like living out a fairytale. Wonderful article! Really hit your stride..
Can’t wait to see more like this! Thanks Douglas! It was easy to come up with words about such a great place. They could have certainly beefed up my ’03. From what you’ve told me about the owner, he’s definitely someone who sounds trustworthy. Can you imagine if I talked with him? I’d probably never get out of there. I’d love to hear those kinds of stories. Nice write up! Hope to hear some of those stories about some of the famous cars he has worked on. Mart! This was probably one of my most intense posts, with the interview, tour, etc. This is a crazy awesome place and no kidding about the documentation. It is timely and precise, no guessing on the customer’s part. If I can get pics of the Impala I certainly will. In the meantime their Facebook page has some awesome pics of a gold 1978 TransAm. Thanks again for posting! Hi Debbie, What a great piece on a bunch of guys who have a passion for cars. Manns Restoration are similar to what we do, but they are on much wider scale and variation of makes and models. We specialize in early Mustangs with the odd other makes now and again. Most of the customers we have want the cars looking back to stock or as original as it can get. But these guys will create something new from old, that is a real skill in itself. A great write up Debbie and we could do with more like it. Hey Mustang Maniac, Thanks for your great feedback. It was an amazing visit. Each room reveal a new type of artistry, like none I’ve ever seen. I can only hope to have a car and bring it to a great shop like this someday. I wish all garages had the character of this one. Such a great find. Hey Jon, Thanks for your wonderful comment and support. It certainly is a place we’d trust our cars to!